It’s probably no surprise for me to admit that I find great comfort in inspiring words – they’re places I dock my soul for respite, rejuvenation and revelation. Words are powerful. So when I came across an Instagram account called ‘YouAreBrave‘ I was hooked. 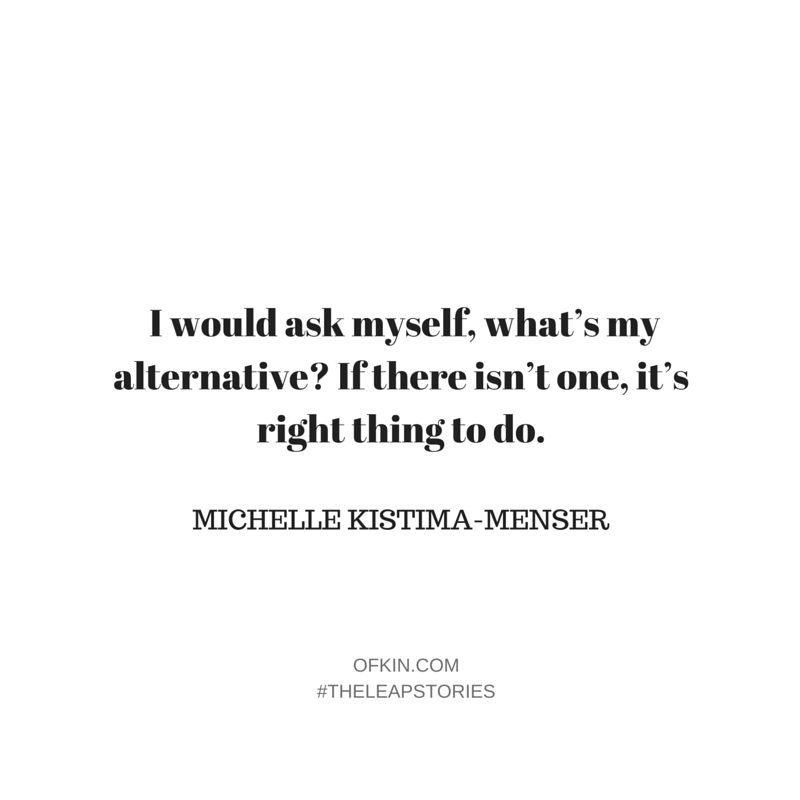 The beautiful woman behind the account is textile designer Michelle Kistima-Menser, and I think she’s a little bit genius to have made an affirmation her business name – it’s emotionally potent and becomes a self fulfilling prophecy for her way of being in the world. While employed as a designer for a national retailer for years, she recently made the leap to start her own hand printed textiles business under the name You Are Brave, words her Great Aunty Mabel used to say to her. Michelle’s story canvases her lineage of brave women in her life, her previous leaps, the stress of being ‘under challenged’ in employment and tips on overcoming fear. The stories we are told as children formulate our ideas and beliefs as adults. Knowing Michelle’s story reminds me to check in with my childhood stories and see if they hold true (sometimes with the help of my lovely psychologist Jill), and the importance of the ones I help create with my own kids. In our house we are often heard reminding each other ‘We can do hard things’. Because yes, we can. Well, I grew up with music, sewing, knitting and embroidery and seemingly endless cups of tea being made in the house. We shared a house with 10 other family members (3 generations) until I was 6. At that age I remember wanting to be a ballerina and the owner of Black Beauty! Every little girls dream I guess. Oh jeez! I’ve studied/done so many courses … Ikebana, Spanish, web design, block printing, yoga teaching & fashion design. However, after high school I did a degree in fine arts majoring in sculpture and design. I actually wanted to major in photography but missed out on a spot (due to limited capacity in the department). Actually I’m quite glad I made the decision to do sculpture … I loved it’s open parameters. I learned valuable construction techniques; how to use various tools and equipment and had the opportunity to work with lots of different materials …. wood, plaster, metal, sand, rock, paper, fabric and found objects … It was a very tactile experience that also developed my spatial awareness. I also had the chance to study alongside some great artists like Alan Giddy and Martin Sims who was my lecturer. Some 6 years later I realised there was a career called Textile Design and instantly knew that this was what I had been looking for. So I did a part-time certificate course while I was working full-time in the corporate world. I simply LOVED everything about textile design and the screen printing process! Undoubtedly the decision to quit my ‘day job’ recently and pursue my own business was the scariest move I’ve made. With a young child and mortgage to consider, it was a huge decision … but at the same time I knew I had to do it. I had the support of my family and my husband (thankfully) had a stable job. So it was a ‘now or never’ kind of thing. I was working as the senior textile designer for a national retailer. It was mind numbing and soul destroying work that involved not an ounce of creativity and, unfortunately, was also set in a socially toxic environment. On a positive note though, I guess it served its purpose … it ended up being the push I needed! My great aunt Mabel – My spiritual inspiration and the person I most aspire to be like. She embodies love to me and I am so fortunate to have grown up with her being my best friend and like another mum to me. 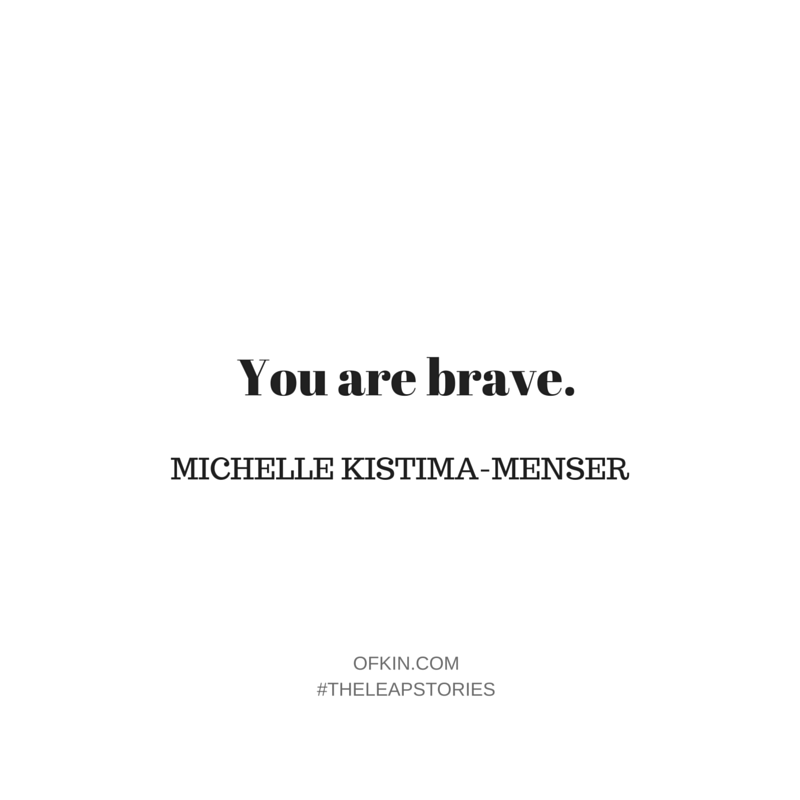 She’s also the person behind the name YOU ARE BRAVE. My parents – For their solid work ethic and believing in the importance of education. They also gave me the chance to be exposed to more opportunities by migrating to Australia (we left Apartheid in South Africa in 1984). It’s a tough thing to do to pack up your life and leave your family and your roots to try to make a better future in a foreign place. My grandmother Iris – She’s been such strong female role model to me. She is the entrepreneurial type. It’s in her blood and she still has her solo sewing business at age 92! My 4 year old son – Just having a child is such great motivation for getting your sh*t together! I didn’t want him to grow up with a drone of a mum coming home from work empty or bitter and less than passionate about work and life. I want him to love what he chooses to do and be exposed to broad ideas about what work and life can be. Looking back … not that much really. I had the business name, some branding, the domain name and a general idea of what YOU ARE BRAVE would entail. I’d looked at a business plan template but I certainly can’t say I knew what I was doing or where I was heading. I felt as though I was walking into a fog but I firmly believed it was the right path and that I had the right stuff to get to the other side. I totally expected that I’d walk out the other side into glorious sunshine. 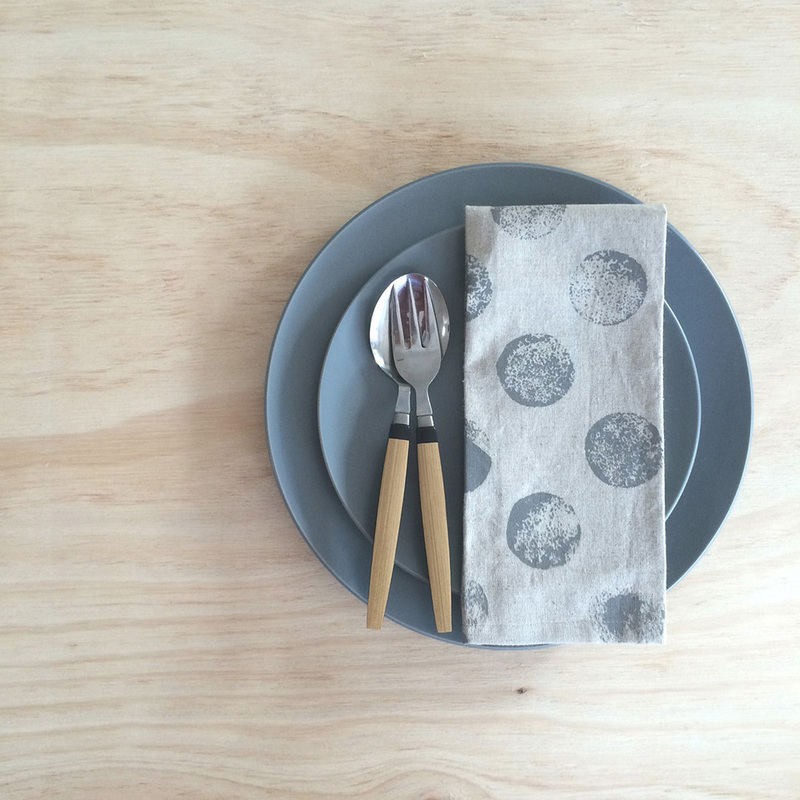 Michelle’s beautiful hand printed Napkins. You can find them and more treasures here. I will never forget those words as it was not only the most shortsighted and absurd thing I’ve ever heard, but it also absolutely cemented in my mind that I was completely in the wrong place and HAD TO get out! What a great question! My whole brand philosophy is in essence about this. Not only was there the fear in the initial decision to start my own business but like most people there’s consistently the need to address challenges/fear … both in the business and in life. Since making the leap, I find myself looking at it more rationally than I used to … Where does the fear stem from? 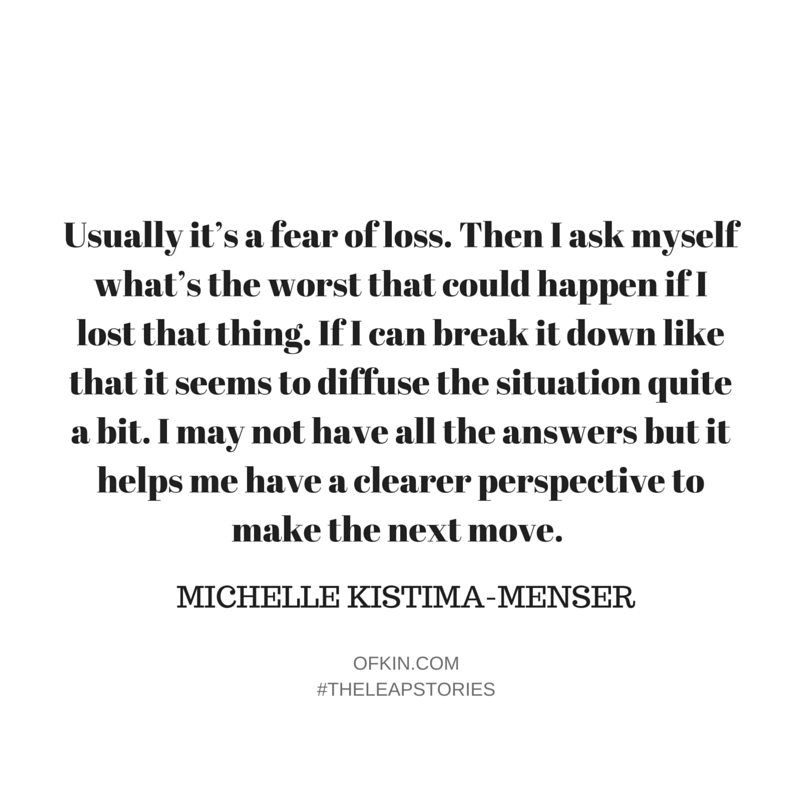 Usually it’s a fear of loss. Then I ask myself what’s the worst that could happen if I lost that thing. If I can break it down like that it seems to diffuse the situation quite a bit. I may not have all the answers but it helps me have a clearer perspective to make the next move. My husband is a great sounding board in times like this. Something I also tend to do is to put my worries or fears into my meditations/prayers and ‘leave it there’ i.e. I get on with things. I’ve found the answers or a way forward usually becomes clearer after time. When it’s ready. When I’m ready! 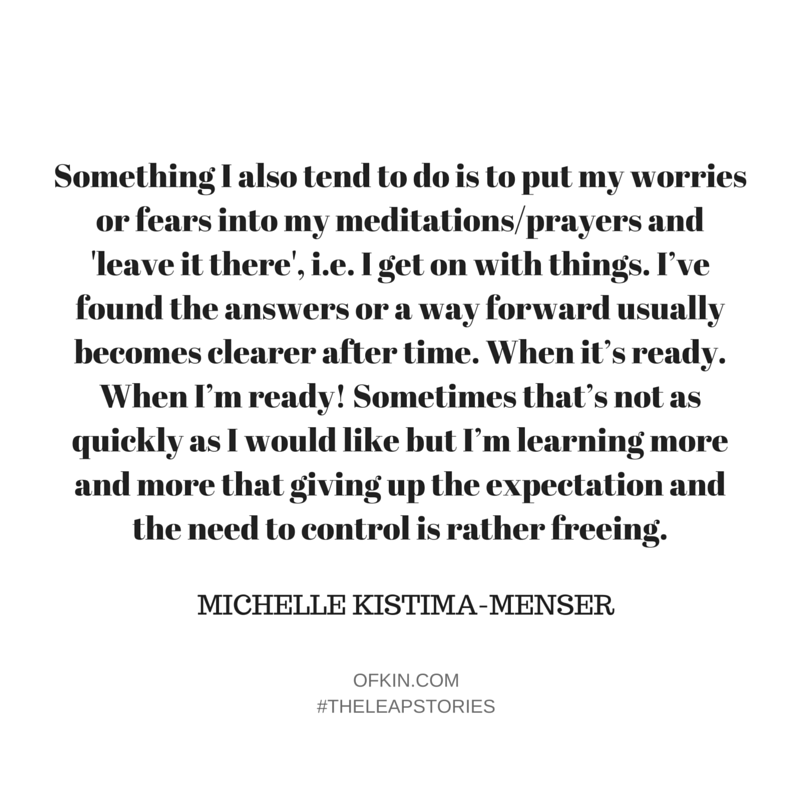 Sometimes that’s not as quickly as I would like but I’m learning more and more that giving up the expectation and the need to control is rather freeing. Also in recent times I’ve been able to look to my label’s name ‘YOU ARE BRAVE’ … and I think about how the name came about … through my Aunty Mabel, the quietly spiritual being who encouraged me as a child and still does even though she’s no longer with us. Being able to say to myself “Michelle …. YOU ARE BRAVE” is very self-affirming as if Mabel was still here. I had saved up a little to start the business and that soon dwindled. However we put some plans in place before I left my day job that would provide us with a little extra income. I am also blessed to have a wonderfully supportive husband. He has a relatively stable job but also supports the business/me morally and who is just wholeheartedly into me! I’m so, so blessed to have him. After leaving art school all I wanted to do was travel so I took a part-time job at an insurance company. That then led to a full-time job with the same company. Six years later I realised I really needed to be creative again, so I took the leap out of the corporate world and eventually found my first job as a textile designer. While working as a full-time textile designer I started a hand-printed t-shirt company back in the early 2000s. It was hard work doing the printing and canvassing retailers in my spare time but the business was actually starting to do quite well. We had just bought our house and had to make a decision … do we remortgage to grow the business, keep it small or let it go. In the end I realised I wasn’t confident enough to take the next step. So I tried to continue on a small scale but that wasn’t going to work for very long. It was exhausting both working full-time and trying to run the business on the side. About three years later I stopped working on the label but gained a whole lot of insight into running a business. Had you asked me this 18 months ago I think I would have had a long list. Nowadays it’s harder to think of things I’d be fearful of. Not that I feel invincible or anything, I just try to see challenges as opportunities. They may involve some form of risk but I’m really trying to work on letting go of the need to control everything a bit more. Invariably, taking on a challenge allows you the chance to grow … and why wouldn’t I want to grow? I believe in myself more now since taking the leap and I try not to entertain fear too much. I’ve learned and continue to learn more about myself as a result of choosing to work for myself… I feel like I’m growing all the time. I have a lot more creative energy and curiosity that allows me to explore and experiment more. Also, the sense of freedom is really quite mind blowing for me. I’m thoroughly enjoying being able to work to my own schedule. There’s always the question of cash flow these days that was never really there when I was working full-time. We’ve put some financial plans in place that supplement the business but also we’re learning to do without some things too. I try to be grateful for what I already have and make creative use of the things we have or can afford. It’s surprising how much creativity can come out of restriction! One leap at a time please! I’m quite happy to delve further into this one for the time being! My dream for YOU ARE BRAVE is to supply the textiles for a hotel or resort that shares a similar ethos about the natural world… That would be a huge and willing plunge! I also have a vision. One that I’ve had for over the past 20 years or so…. involving some country acres, within short driving distance to the ocean, a self built cabin/shack, chooks, a goat, a couple of dogs, veggie garden, maybe some bees and relative self sufficiency. That would be quite some time in the future… so we’ll see! I don’t say this out loud (I have a 4 year old) … but lately I find myself saying “F*ck It!” a lot. And of course I say “You Are Brave” … sometimes I add “Lady!” on the end. I admire anyone who has true passion or a positive belief and relentlessly pursues it. There’s been a whole herd of leapers out there in recent years and it’s so exciting to meet and hear about ‘ordinary’ people doing these bold, brave things, taking risks and backing themselves! This Maker Movement is not only creating authentic and meaningful work for themselves but also enriching the lives of their families, their immediate environment and the greater community. Communities of these people are getting together, working together in creative ways and supporting each other. This is the new wave of change makers who I admire right now. I’m really not much of a risk taker so my advice would be to make sure your itch is more like a burning desire. It’s got to be the hot coals you will willingly walk over… and be prepared to deal with the blistering consequences! I would ask myself “What’s my alternative?”… If there isn’t one, it’s right thing to do. Hearing: A genius of a DJ called DJ XS (on Youtube & Soundcloud). I’m addicted to his old school soul, funk, jazz & hip hop mixes. They’ve actually been quite instrumental in my decision to make the jump & they definitely keep me motivated & focused when I’m working. I also like a South African band called Beatenberg who combine traditional Southern African beats & riffs with modern pop. Eating: Porridge! With stewed apple, pear, quince & cinnamon. I can’t get enough on these cold Sydney winter mornings. Reading: I rarely read anything but co-incidentally I borrowed a book from the library last week called “Darwin’s Sacred Cause: Race, Slavery & The Quest For Human Origins” by Adrian Desmond & James Moore. It’s taken me a week to get to page 5, so I’m not holding my breath about finishing it any time soon! Loving: Life! My family. Meeting other creatives & making new friendships. Do you have a few words or a little mantra you use to guide yourself? Mine personal one are ‘choose courage’. I’d love to know yours by sharing them in the comments below. Oh I love receiving your Sunday Leap story posts Kylie! Thankyou for sharing Michelle’s leap story today.